← Palm Jumeirah, Dubai. June 14th, 2011. Baden Ontario, Canada. June 14th, 2011. Police have closed downa section of Snyder’s Road East, after a sinkhole appeared in the roadway Tuesday afternoon. 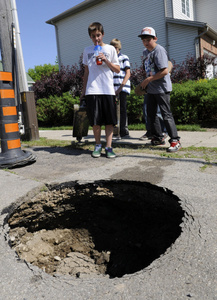 Waterloo Regional Police said the sinkhole, which measures several feet across and about three metres deep, is located near Coachman’s Lane and the road is closed between Foundry Street and Sandhills Road. No one was injured and crews are on scene attempting to repair the roadway. Police are asking motorists and pedestrians to avoid the area. Only residents will be permitted to pass. There is no estimate on how long the road will remain closed. This entry was posted in Pictures and tagged Baden Ontario, Baden sinkhole, Canada, Canada sinkhole, Coachman's Lane, Ontario sinkhole, sinkhole. Bookmark the permalink.